Four people were killed in eastern Saudi Arabia after a suicide bomber tried to enter a Shiite mosque during Friday prayers. Islamic State has reportedly claimed responsibility. It is the second attack of its kind in a week. A car exploded outside the Imam Hussein Shiite mosque in the Al Anoud district of the city of Dammam. However, security officials, cited by local media, say the attackers failed to enter the building itself. A car parked near the mosque triggered security forces' suspicions, but as they tried to approach it, the vehicle exploded, killing four people and setting nearby cars on fire. One witness, identified only as Ahmed, told Reuters he was told by acquaintances at the mosque that a man was killed when he tried to prevent the bomber from entering the building. Another witness said a passerby was also killed in the blast. The driver of the car that exploded was also suspected killed. Residents circulated pictures of the body of the man believed to be the bomber. The terrorist organization Islamic State (formerly known as ISIS, ISIL) has claimed responsibility for the attack in a Twitter post, Reuters reports. On Friday evening, the US military said it doesn’t regard the Islamic State group as a “significant threat” for Saudi Arabia, also failing to confirm the attribution of the blast, according to Reuters. "In terms of Saudi Arabia and [Islamic State], we have no indication that they pose a significant threat at this time," said Colonel Patrick Ryder, a spokesman for the Pentagon's Central Command. 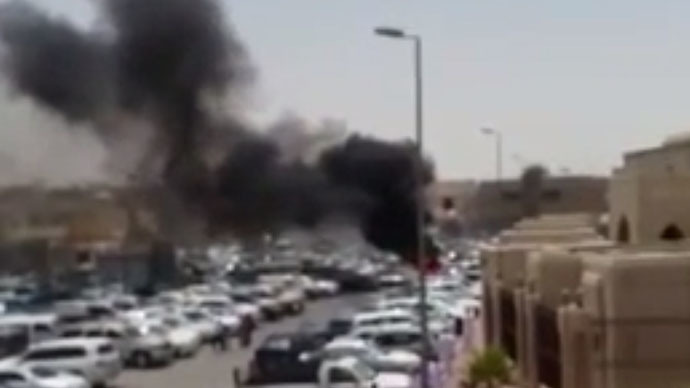 Photos show large black clouds of smoke billowing over a parking lot outside the mosque. Other pictures show the congregation reacting to the sound of the explosion outside the building. Saudi security forces surrounded the area and began investigating the incident. It comes after a suicide bombing on May 22 killed 21 worshippers at a Shiite mosque in al-Qadeeh village. That attack was claimed by Islamic State.